Investigators blame decades of thefts on a man found living alone in Maine woods. WCSH's Chris Rose reports. After spending 27 years alone in the woods of Maine, the man dubbed the North Pond Hermit is adjusting well to his less solitary new home – a jail cell. “He’s perfect,” Capt. Marsha Alexander of the Kennebec County Jail said of Christopher Knight, whose remarkable story has made him a lockup celebrity. Knight, 47, ended up in jail after he was caught breaking into a camp in Rome, Maine, last week, police said. He told police he had been living in the forest since he left home in 1986 and had committed more than 1,000 burglaries for supplies, they said. Christopher Knight, believed to be the North Pond Hermit, in a booking photo after his arrest last week. Police say he's been living in the woods for 27 years. 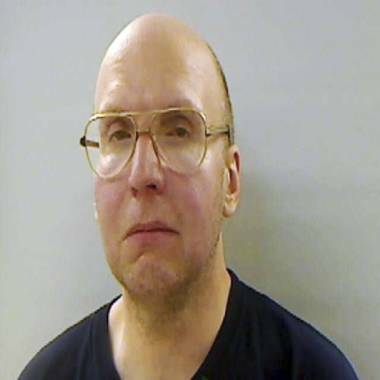 State police said they have no reason to doubt Knight’s tale of living in total isolation, through rough Maine winters, for nearly three decades. Now he’s sharing a unit with six other prisoners. He hasn’t had any visitors. “He’s willing to see some of his family members, but he wants to know which ones first,” Alexander said Thursday. Police have said Knight’s family did not report him missing when he vanished from the small farming community of Albion in 1986, two years after graduating from high school. A family friend said Knight’s relatives believed he had gone to New York City. His mother, who still lives in the area, could not be reached for comment. A high-school classmate, real estate agent Larry Stewart, said he couldn’t believe his eyes when he saw Knight’s photo during a TV news broadcast about a hermit. “I said to my wife, ‘Geez, I know that guy,’” Stewart said. He recalled Knight as “very quiet, reserved, always in the background,” he said. Knight was part of an “outdoor adventure” program where students did rope courses and climbed walls, and he wondered if those skills helped him in the wild. Police say Knight lived in a tent, steeling himself against the cold with multiple sleeping bags. He stole his food, clothing and supplies from dozens of camps in the area. He gave up on fishing because it was too much work and he didn’t hunt. Most of his time was spent reading stolen books or meditating, police said. Officers said he was up on current events because he listened to news on a portable radio, but he’s not interested in talking to the media now. “He’s denied all requests,” Alexander said. But for a man who shunned human contact for so long, Knight is surprisingly sociable. Knight has not given police an explanation of why he retreated into the woods. And they are stunned that no one stumbled on his makeshift campsite, which was littered with propane tanks and batteries and had clothing hanging from a line. 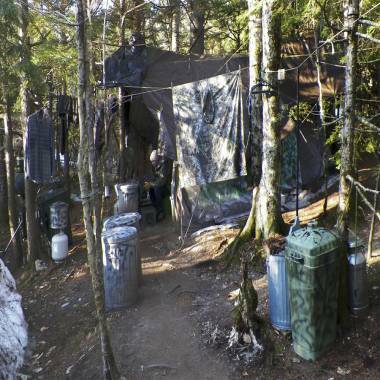 "This is not a remote, desolate site," Maine State Police spokesman Steve McCausland said. "He was within a mile of a traveled highway." Knight is charged with one burglary but police said that his confession could lead to more. While break-in victims have spoken of the frustration of being targeted, others feel sympathy and a measure of awe for Knight. “He’s got this kind of Robin Hood aura about him,” said Stewart, noting that police said Knight only took what he needed to survive and was contrite when caught. He said his high-school classmates want to help find him a lawyer and maybe a place to live when he gets out of jail. “I’d like to make up for the fact that I didn’t get to know him that well back in school,” Stewart said.